After all the gift projects for everyone else, I have been in the mood to knit myself something. Don’t get me wrong, I love making things for other people. But, looking back through my project page on Ravelry, I have made almost 130 projects over the past 3 years (most but not all recorded on Ravelry; I’m not always good about that), and only a small portion of those were for me. All of the final products went to happy, loving homes, but now it’s my turn. But I’ve been good this time! I didn’t even peek after the first clue was released. It’s actually been a lot of fun. 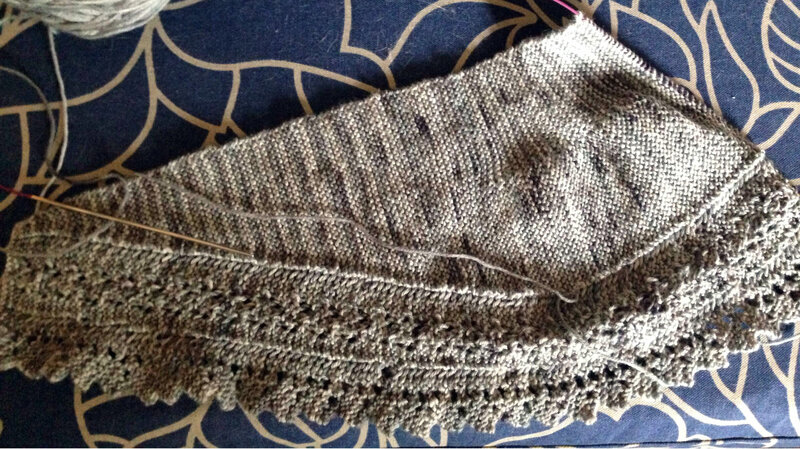 The only knitting time I really have lately is on the weekends, which coincides with this MKAL perfectly. Each Saturday, Wendy D. Johnson releases the next clue. I always know what I’m going to be working on, but I get the fun of not knowing exactly how it’ll turn out. Normally this would freak me out at least a little, but I’m confident in Wendy D. Johnson’s designer capabilities. I know I’m going to like the end product. Not a great pic, but here it is! And so far, I really do like it. It looks like this is going to be a cute shawlette, something that I don’t have in my wardrobe yet. I can see this being a nice thing to keep at the freezing office or to wear when it starts getting chilly in the fall (I love that we have four seasons up here). I picked a neutral colour, Stroll Tonal Sock in Thunderhead from KnitPicks, from my stash in the hopes of not only getting more wear out of it but that the pattern would show up. As I’m working on it, though, I can’t help imagining it in some bright colours, too. Maybe I’ll have to make some more! We’re on the second clue now. The pattern has been very easy to follow. I recommend this for a knitter of all levels, really, especially a beginner wanting to try a bit of lace. There’s just enough lace to keep things interesting on the edging, but then there’s garter stitch to give a nice break in between. I love it. This has been my weekend TV knitting project. The next and final clue arrives next weekend. I’m kind of sad to see the project ending so soon! At the same time, though, I can’t wait to wear it. Are you participating in the MKAL? If not, what are you working on? So many KALS so little time …………. 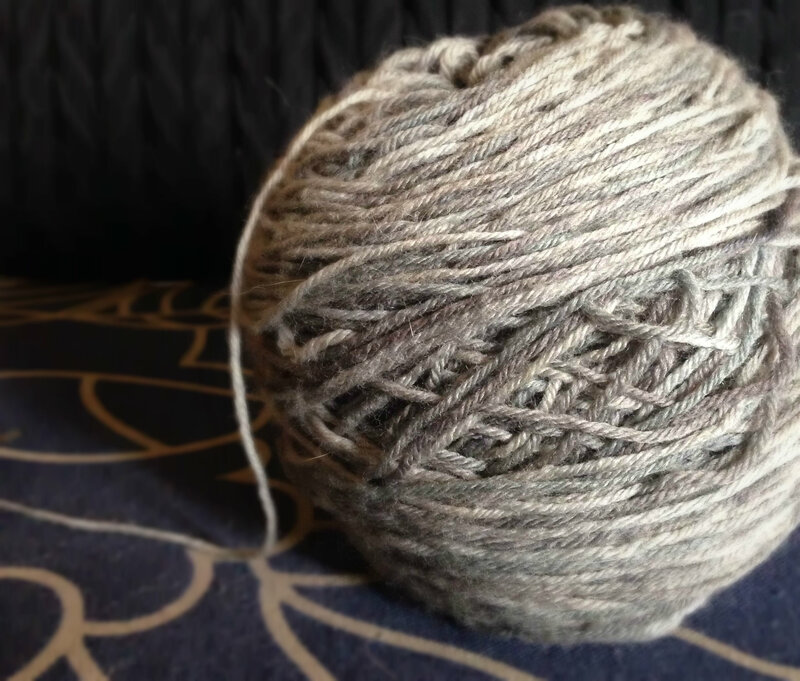 I haven’t done a mystery KAL yet ……. It looks really pretty so far. MKALs can be such fun! I love the yarn you’ve chosen and your progress so far. We all need to do something for ourselves sometimes – you should never feel bad about that! This way, when you wear your shawl, you will get all the googly-eyes and compliments!!! I’ve only done one MKAL and decided I’m not very good at them – mainly because like you said, I prefer to see the spoilers first. I’ve never done one but this project looks perfect for my new skein of Ella Rae Merino Lace!